Using only material geometry and interference patterns, MIT researchers have devised a novel way of passing light of any colour only if it comes from a specific angle. Light coming from other directions will be reflected, something which can be desirable in certain applications. Those who could benefit immediately from the findings are solar photovoltaics, detectors for telescopes and microscopes, and privacy filters for display screens. The researchers built a stack of 80 ultrathin layers built out of two materials with different refractive indices (glass and tantalum oxide). At the interfaces, small amounts of light get reflected, but combining the surrounding layers in a specific fashion, only light coming in from a certain direction and at a specific polarization will become reflected. “When you have two materials, then generally at the interface between them you will have some reflections,” the researchers explain. 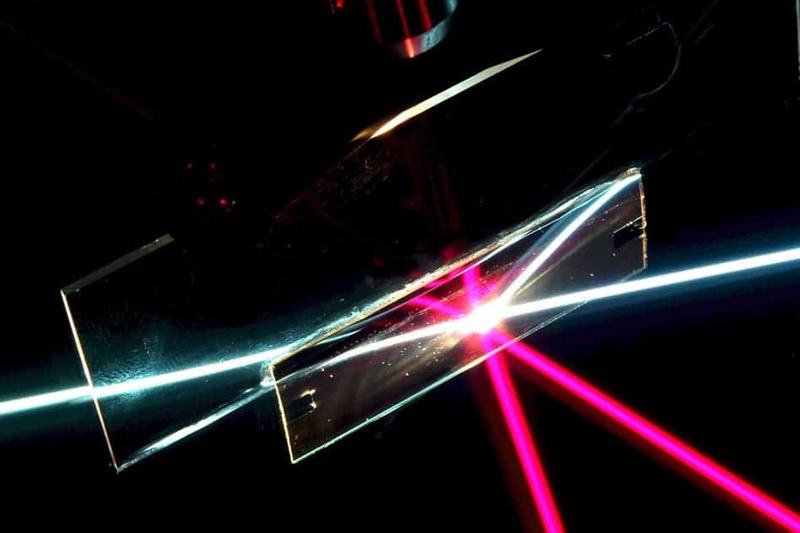 Previously, researchers demonstrated methods that selectively reflect light for one precise angle, but these involved narrowing down a range of light frequencies (colours). The new system allow all colours in the visible spectrum of light to be reflected from a single direction. A video of the experimental set-up can be viewed below. A thermophotovoltaic cell that harnesses solar energy to heat a material could employ such a system to radiate light of a particular colour. At the same time, a complementing photovoltaic cell would use all of that colour of light, limiting heat and light lost to reflections, re-emissions and such, thus improving efficiency. Microscopes and telescopes could also potentially benefit from such a system in scenarios where bright cosmic objects interfere and block the view of an object of interest. Using a telescope that only reads light from a certain angle, it’s possible then to observe very faint targets masked by those that are brighter. Display screens or phones could exploit this to only display information when the person is right in front of them, to avoid peeping. Findings appeared in the journal Science.